Pra Prohm Perd Loke (Brahma opening the world) – Traimas edition 2551 BE. 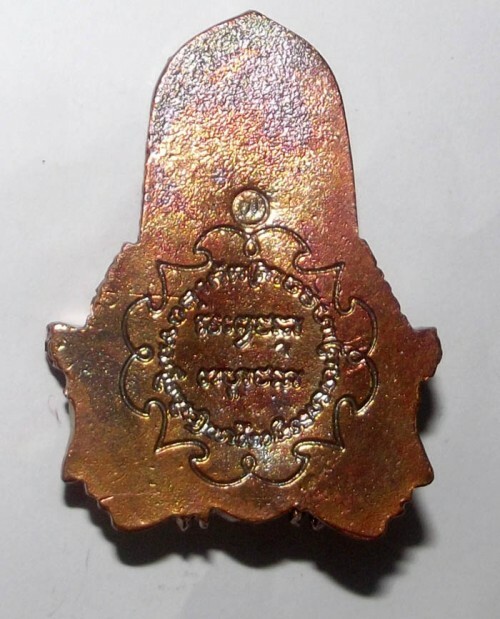 This Brahma amulet comes from Luang Por Phad’s 2551 BE ‘Traimas’ edition of amulets, which recieved a whole three month Rainy retreat Semester of Jhanic Empowerment and Incantations from Luang Por, each day and night in his Kuti. This edition saw a number of different amulets released, including some sacred Bronze and Nava Loha Garuda amulets, some ‘Takrut Fon Saen Ha’ (Metta Mahaniyom Takrut) amulets made in Olden Times style wrapped with cord and herbal resins, Some Pra Somdej, and Some Loi Ongk Statuettes. The Amulet is made from Nava Loha, a Sacred Alchemical mixture of nine sacred metals using ancient artifacts, amulets, Yantra foils and other Sacred metallic objects, with pure gold and silver added for increased lustre, sheen and quality. Size; 5 Cm High x 3.5 Cm Wide. Luang Por is famous for his making of Garuda Amulets, and Brahma Amulets. His Somdejs also often feature the Garuda also. For the present day Masters, LP Phad is one of the Standard Beares of Garuda and Brahma Wicha for amulet making, and are of the most collected of his amulets, for their fast disappearance from the Marketplace, and also for their quality and long Future. 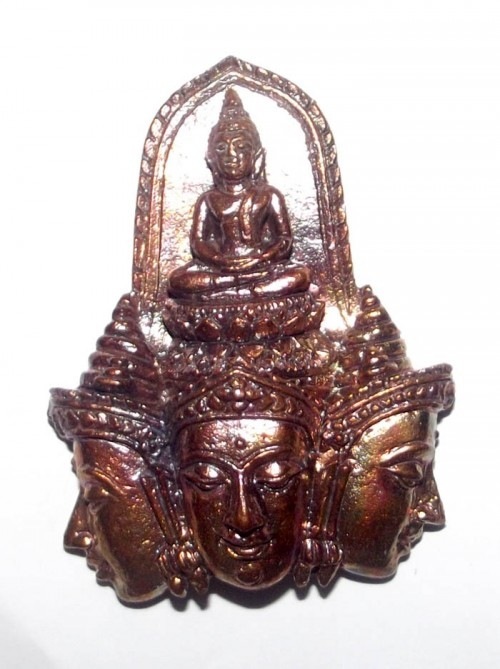 The Brahma Amulets were made in both Nava Loha, and also in Sacred Powders with gold leaf coating. 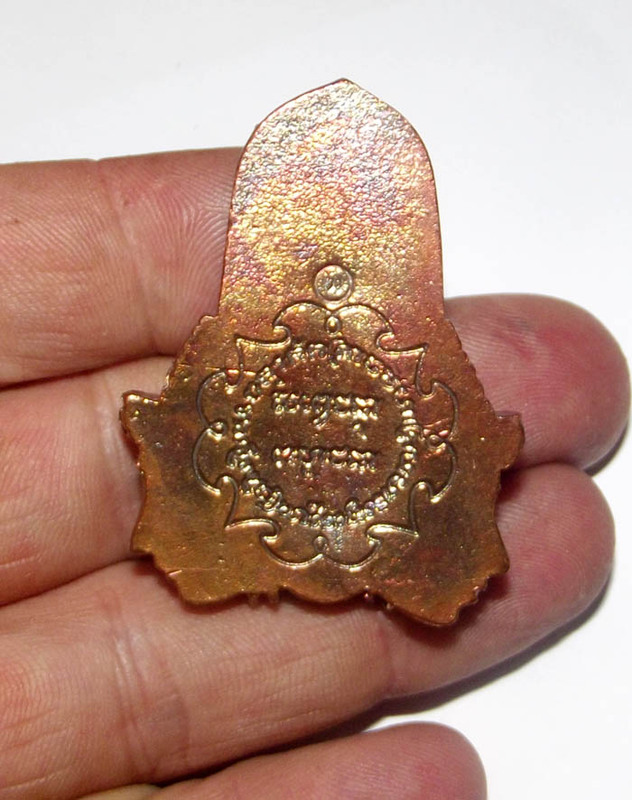 The Nava Loha versions of all amulets in this series are now already becming rare collectors items, and considered to be powerful sacred amulets whose power does not fade. The amulet can be encased for wearing, or be placed on a small ‘Pan’ (raised golden or silver tray) on the altar. Can be used to immerse in Holy Water Bowl to empower amulets with (not advisable if you want to preserve the condition of the amulet). The front has the Buddha Sakyamuni, sitting over 3 Brahma faces with the rear side having a sacred Kata in circular form, invoking Brahma. An Ancient Vedic Kata Incantation is inscribed into the middle (Sabbhe Chanaa Pahoo Chanaa). The Kata Invokes good fortune, successful Business and Trading Happiness and Health. LP Phad is fast becoming one of the last decade’s preferred master Monks and his amulets are becoming ever popular. He makes amulets more often lately but never makes them in large numbers. 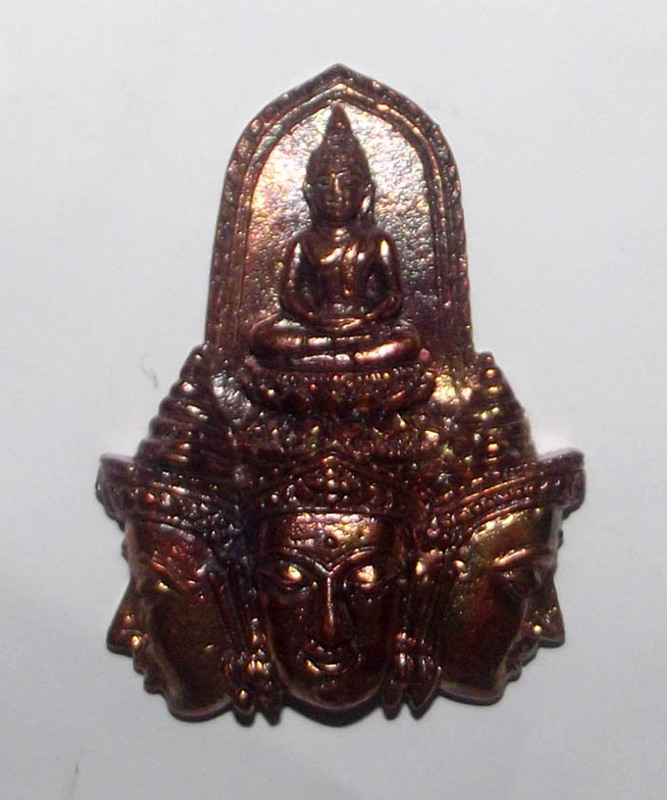 It is well known that Luang Phu Phad makes very powerful Brahma (Pra Prohm) amulets, and that his Pra Prohm amulets have a very high amount of Puttakun power to be able to stop, inhibit, or dissolve bad luck and negative Karmic influences. LP Phad uses the power of his Vipassana Yana to empower the amulets (this is a very effective way and in my opinion the most powerful way to empower amulets). The power of Vipassana Yana allows the mind of the practitioner to be able to enter the stages of Jhana absorption. I have learned in my times as a monk that the blessing of Buddha statues, Deity images and amulets is only authentically powerful when the Master involved in the empowerment of said amulets has attained the Aruphajhana level of absorption. This is the formless state, which is also the cause of rebirth as a Brahma Deity, who are all formless and have a mind which is tuned into only the formless realms. This is the way to instill an amulet or any inanimate object with psychic power. To see that Luang Phu Phad uses the Vipassana Yana to empower the amulets with, for me is very convincing and re-assuring because from my personal experiences in Jhanic meditation, i have seen this to be the true way to arouse Prana anergy and the formless abstract state of mind necessary to project visualized magi power into an object. No words must be in the mind when this is performed. The mind must be completely projected and absorbed in the sensation of the magic spell, which is beyond all words. 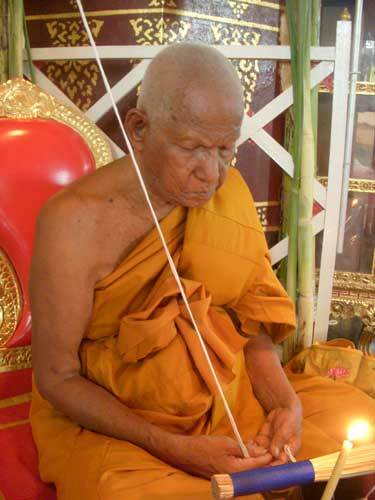 Years ago, LP Phad was a very famous Master Teacher of Vipassana in the Ang Tong Region. The Wicha of Creating Pra Prohm images that were activated using the Vipassana Yana method of empowerment, is a very High Wicha of the Buddha Sasana, because the mental state which has to be realized and induced in order to perform such empowerment, is directly connected with the path to escaping suffering, both in the sense of the Maggha (path to Nibbana/Liberation), as well as the worldly sense of avoiding and preventing dangers and inauspicious events in one’s life. Comes with Original Box from the Temple. Luang Por’s magical power, and the Blessings of Brahma should be able to turn your fate around and switch your luck from bad luck and poverty to become popular and wealthy, as if one has been reborn with a new life, and new chances. Luang Phu Pad Apinanto is the Abbot of Wat Rai temple in Ang Tong Province.